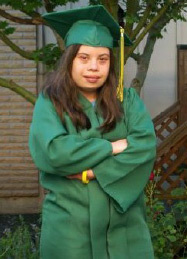 My daughter Chrystal has just graduated from high school. I wrote this reflection of our school journey shortly after our last back-to-school night last September as I ran from class to class, retracing her footsteps through a typical day at school. Almost everyone involved with the world of disabilities utters either a peal of laughter or a snort at this point in the story. But, amazingly it happened, thanks to John Withers, a visionary principal we had the incredible luck of connecting with. I e-mailed him from Nicaragua stating that I would like my 6-year-old with DS, who understood English but spoke only Spanish, to become part of the Spanish Immersion program, which was then starting up at Atkinson Elementary. And he answered: “Sure, come on,” with a few caveats I didn’t understand at the time, but now comprehend all too well: to register her as a normal student and not to expect any transportation. “They’ll do some testing on down the line,” were his words. With the sounding of the bell, I am released into a general education American History classroom where the teacher exudes enthusiasm and talks of wanting kids to like history and to understand how it has affected people, instead of memorizing dates. A brief pause for fifth period, which Chrystal spends as an aide in the school’s bookroom, and it’s on to sixth period. Chrystal – who is an incredible schmooze – had talked her counselor into signing her up for this “regular English class.” I had spent most of the summer warning her that she might find senior English extremely difficult. The final period is Art 3-4, and we are surrounded by a wealth of visual stimuli; color and form and an elaborate grading scheme designed to reward good intentions in this class of 40 students. I walk home through the brisk autumn dark, asking myself why I feel so much happier in the general education setting, with its emphasis on inspiration, than in the learning center with its relentless emphasis on measurement and “adult living skills.” Is it me? It’s been a long day, it’s been a long journey, and I’m a little tired. There have been pages of e-mails, hours and hours of homework, countless IEP EP meetings that always felt like trial by a jury not of our peers. But 12 years on, I have a daughter who moves through school with confidence, eagerly greeting and being greeted; who moves easily between English and Spanish; who understands that sometimes she needs help with things that others find easy; and who is full of illusions, dreams, projects and ideas…and creativity, just like every other 18-year-old. And, yes, I believe that her “typically developing” classmates (whatever that means) have also learned something over the years, as I can note by their total ease interacting with her. We had a miracle happen on entering kindergarten. It fills me with rage that inclusion is ever less the norm in our district, that it is not “the way of the first world” as I innocently thought 12 years ago, that parents and students still have to fight so hard to be included in the halls of our public schools. But I am convinced that it’s a battle worth fighting.